To use Walter Benjamin's terminology, Gomulicki can also be called a producer of culture. Looking at Gomulicki's work retrospectively, one notices the evolution of forms revolving around the categories of pleasure and ecstasy, already evident in the series of photographs shown in the 90s, ia, in the ZPAF-CSW Little Gallery; photographs which revealed a fascination with dolls and bodily parts, particularly parts of the female body, which the artist would render abstract by extreme close-up – an attempt to penetrate and decipher the carnal code of desire and fantasy. (Sentimental Typologies, 1999). Literature and film are also amongst Gomulicki's interests. His interest in literature, which he grew up with – his great-grandfather Wiktor was a poet, writer and the first translator of Baudelaire, and his grandfather Juliusz Wiktor – a passionate researcher of literature – Gomulicki employed in his project Spring in the Library (2005-2010), in which the areas of fiction and knowledge contained in books are subordinate to aesthetics. Viewing Maurycy Gomulicki's subsequent projects, one may reach the conclusion that for the artist, woman is an object of cult and desire; an objectified woman, subjected to ogling by the male eye, which carefully registers every detail - a controlling eye, focused on pleasure. She is an absurd being, on the one hand, extremely sophisticated, on the other, common in her extraordinariness. When conceived in this manner, the function of the artistic subject is as precise as possible; a dissection of a concrete, living woman in order to reach the abstract essence of temptation, of mythological femininity. As captured by Maurycy Gomulicki, woman is not just for looking at and to consume. This is different from a gradually exposed spectacle, a book divided into intriguing chapters. Woman is a doll, a mannequin and a goddess (Gomulicki is an idol-worshipper). 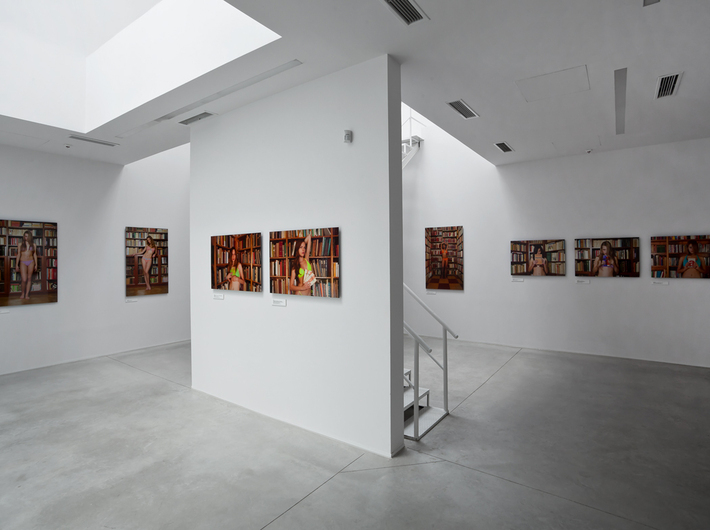 The entire project revolves around my grandfather, Juliusz Wiktor Gomulicki, and his book collection – the library of a humanist and a wayward spirit, an aficionado of curiosities and a ladies man. Books were truly the backdrop of my childhood – for the first six years of my life, I lived in a place floor-to-ceiling piled chockablock with books, often in double rows. For the next thirty-something, I was an almost daily visitor there,. I treat a library as a source and as a backdrop to let my imagination roam; as a place of manifold initiations. The smell of dust and the daydreaming about girls coexist perfectly in my consciousness. To this day, whenever I look at pornographic photographs with books in the background, I find myself deciphering the titles visible along the shelves, instead of concentrating on the ecstatically writhing bodies. Books are not only the knowledge contained therein – for me, they are above all a source of pleasure. The books and women in my life have become as much the triggers for my fantasies as the conduits of their fulfillment. My life story is full of women writers and women readers.